Liz Wiebe, M.S, currently works at the University of Wisconsin Medical Foundation in Madison, WI as the Health Services Manager. Her background is in Health Education and Exercise Physiology, Most of her career has been in Worksite Wellness. 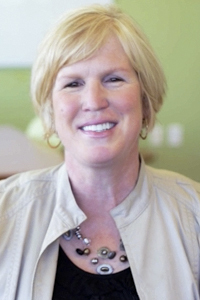 She spent over 20 years at Lands’ End in Dodgeville, WI in a variety of roles, the most recent being the Sr. Manager of Work Life Benefits., where she had oversight of the Comer Center, an 80,000 sq. ft. fitness facility, the on-site Lands’ End Medical Clinic, and the Day Care Center. Other career experiences include the YMCA, Nicolet Instruments, and Duke University Cardiac Rehab. Her background is in Health Education and she earned both her B.S. and M.S. from the University of Wisconsin in Madison. She has 3 children and enjoys the outdoors, especially spending time at their family cabin in Minocqua, sporting events, reading, and traveling. New to the academic setting, she is looking forward to helping to develop new Wellness Professionals in a career where your vocation can truly be your vacation!